welcome As Easter approaches and the weather improves we look forward to taking part in some local events. The Business Association are hosting their annual Easter Egg Hunt on Saturday 6 April, find out more in our children’s section of the magazine. Also, on page 10 you can read all about a new initiative in Palmers Green, The Palmers Green Action Team. They will host their inaugural event the ‘Palmers Green Spring Clean’ this May. As a long standing local business owner I am pleased to be able to sponsor this event. It is lovely to see local residents getting behind a community project that will ultimately benefit everyone and hopefully increase footfall to our high street. Traditionally spring is also a busy time for those looking to move home during the summer months. Despite the uncertainty brought about by Brexit, Palmers Green’s properties are in fact selling faster today than they were this time last year. If you are considering selling or have a property that you want to rent out please do not hesitate to contact us for a current market appraisal on 020 8882 7888. A recent Zoopla report showed that the wave of new “online estate agencies” were losing market share across London and the UK, particularly on properties with values in excess of £200,000. In recent months a number of these businesses have either gone into administration or have posted unsustainable losses and, on the basis that they generally take their fees from clients “upfront”, many homeowners have found that the promise of a low-cost sale has actually turned into a nightmare of lost money and no sale. As a traditional estate agent we combine a prominent high street location, experienced local staff and extensive online targeted marketing to ensure that the best interests of our clients are forefront. Coupled with a personal approach to customer service we only get rewarded on the successful conclusion of a transaction. Please contact us for more information on our services. Anthony Webb, supporting local schools, charities and local action groups to enrich our community. funding to help micro-businesses, charities and low-income Londoners to scrap older polluting vehicles and prepare for the UltraLow Emission Zone (ULEZ). More details on the ULEZ, scrappage scheme and to check if your vehicle is compliant can be found on the TfL website. London Assembly Investigations The London Assembly scrutinises the work of the Mayor and matters of importance to Londoners. We investigate and make recommendations to the Mayor and other bodies on how their policies could be improved to make London better. Current investigations are examining; child dental health, organ donation in BAME communities, the disability employment gap, temporary accommodation and welfare reform and Full details and how you can send in your views can be found at www.london.gov.uk Joanne is the London Assembly Member for Enfield & Haringey and is the statutory Deputy Mayor of London. Introducing local artist Feroze Antia Feroze Antia was born in Bombay, India and studied mathematics before moving to London to complete his PhD. He recently retired from teaching mathematics in East London. He lives in London and Bangkok. Feroze has no formal qualifications in art but has had a great love for it since childhood. Between 1998 and 2003 he concentrated on collage and developed a unique style of depicting l a n d s c a p e s. Then till 2008 he worked in oils mainly interested in architectural landscapes of London. In 2010 he moved to Thailand and started painting in watercolour, a medium he now loves but still finds very unpredictable and challenging. His love of vibrant colour and the sensuous layering of paint became his new mode of expression in oils, but the unpredictability of watercolour has led to a more subdued style and colour. He sometimes works plain air, but prefers to translate photographs taken on location to construct his striking compositions. 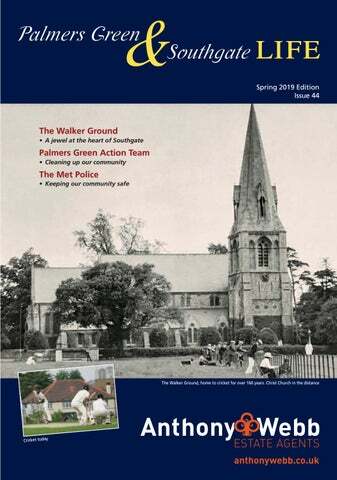 Past Times...The Walker Ground: A Jewel at the Heart of Southgate â&#x20AC;&#x201C; Hidden from view but open to all www.thewalkerground.co.uk This article was composed by: Chris Horner a Walker Trustee; And has been abridged from the newly published book. The Walkers of Southgate and Middlesex a Cricketing Fraternity by Peter Jouning and is available to purchase from the Walker Ground pavilion office. Walker almost beat the touring Australian team, losing by one wicket. Twelve years later the club won the County championship under Donnithorne Walkers captaincy. WG Grace was one of many famous cricketers invited to play at the Walker Ground and in 1868, at the age of 20, played for the United South against John Walkers fifteen team, with a crowd of 10,000 people watching. Teddy Walker had been regarded as the best all round cricketer of his time until WG Grace appeared on the scene and for a couple of years they were on a par. The Walker Ground is a 16 acre Sports Ground located on Waterfall Road, opposite Christ Church in the heart of Southgate; held in Trust since 1907, for the people of Southgate, to be used for sports and recreation activities. The ground is home to Southgate Cricket Club, Southgate Adelaide Cricket Club, Southgate Adelaide Hockey Club, Southgate Squash and Racketball Club, Oakhill Tigers Football Club, Southgate Rugby Club, Omonia Youth Football Club, 6th Southgate Scouts and The Southgate Weld Lawn Tennis Club. The Walker Ground, formerly known as Chapel Fields formed part of the Walker family home estate, Arnos Grove. The ground was given by Russell Donnithorne Walker, the last surviving brother of a cricketing dynasty, of seven brothers and this is their remarkable story. The Walkers are the only family in the world known to have provided seven brothers to play for a first class cricket team. Isaac Walker the grandson of the original owner of Arnos Grove and his wife Sophia had twelve children, five daughters and seven sons. Isaac Walker was a most imposing figure strolling around Southgate village dressed in silk stockings and knee breeches, as befitted his role as an old fashioned country squire. The Walker boys were encouraged to play cricket by their uncle and initially learnt how to play cricket at their respective prep schools. Isaac was a director of the Taylor Brewing Company and had married into the Taylor family of the neighbouring Grovelands Park Estate.The uniting of the two families lead to the formation of The Taylor Walker Brewing Company. Some may say that the Walker brothers were born with silver spoons in their mouths as they lived in the grandest and most imposing house for miles around; Arnos House on Cannon Hill, set in 300 acres of green pasture and woodland. Others may say that the seven brothers were born holding seven cricket bats. The first organised County match played by Middlesex was against Kent in 1859 at Southgate. They were all great enthusiasts of the noble game of cricket and encouraged people young and old to play. Where necessary they would fund matches and provide hospitality for the visiting teams. Southgate Cricket Club was formed in 1855 and a second team, Southgate Adelaide, specifically for the villagers of Southgate was formed in 1870. The full Middlesex side did not return to The Walker Ground until 1991 after a break of 132 years when they entertained Kent in a Sunday League match. The County then used the ground regularly between 1998 and 2011 playing over 20 games. The first four day County match was against Essex and was notable for a fine innings of 241 by Mike Gatting in his last season of County cricket. This remains the highest individual score on the ground by a home batsman. In 1907 at the age of 65 the last of the seven brothers, Russell Donnithorne Walker gave The Walker Ground to be held in Trust, to be used for sport and recreation. He sold Arnos Grove and moved away from Southgate passing away in 1922. Since then the Ground has been managed by a board of Trustees and now operates as a charitable trust. Cricket has been played there for over 160 years and the trustees have honored the wishes of the Walker family and continue to promote the playing of a wide variety of sports and welcome new members, visitors and volunteers. The ground has evolved over the years and now offers Bar and Catering facilities in the pavilion which is open every day. Details can be found on the Walker website. years to get an increase in school funding and I have raised it in the House of Commons at every opportunity. I’ve supported the Fair Funding for Enfield campaign group and I have even shown my awful dancing skills when I ‘flossed for funding’, but in one of the richest countries in the world, we should not have to campaign and protest for the right to a decent education for every child. There is only one chance for a child to get a good education and as we all know getting a good education is the springboard for success in the future. The very thought that this is being threatened due to lack of funding is scandalous. Schools should be given the appropriate funding that they need to pay all their staff and run the schools to ensure children get the best education they can. I am a school governor at two local schools and I know the value of a good education. I will keep campaigning for better funding for schools. Charge and the Low Emission Zone (LEZ) charge. You can check whether your vehicle complies or not with the new standards by using this link https://tfl.gov.uk/modes/driving/ultra-lowemission-zone/check-your-vehicle Driving into the ULEZ The area covered by the ULEZ will be signposted with road signs. There will be no barriers or toll booths. Cameras will read vehicle number plates as they are driven within the zone to check against TfL's database to see if they meet the ULEZ emission standard. TfL has stated that road signs will be in place before the ULEZ starts at every entry point along the boundary and along key arterial approaches. They are due to sit alongside or below existing Congestion Charge signs. ULEZ 2019-2021 The ULEZ will cover the same area as the Congestion Charging Zone until 2021 when it will be expanded to the North and South Circulars. In conclusion, if you regularly drive into the Congestion Charge Zone please check whether your car complies with the new ULEZ emission standards so that you are ready for when the scheme launches on 8th April 2019.
know that some offenders use the public transport network to travel to Southgate to target pupils. We encourage parents and children to report these offences as soon as possible so that we can apprehend offenders at the earliest opportunity. imply stunning 5 bedroom Edwardian family home. The property is within easy walking distance of Palmers Green's shops and mainline station. This beautifully presented home offers 1679 sq ft of bright and well appointed living accommodation over three floors, packed with original features. On the ground floor you will find good size living room, a spacious open plan kitchen/diner with sliding doors to garden and utility room. The first floor offers two generous double bedrooms, a single bedroom and a modern bathroom. The bright converted loft space offers a spacious landing and two further double bedrooms. A front garden and a well maintained 85ft rear garden. would love to connect with local artists for some of our projects. We are supporting the 2019 Easter Egg Hunt on Saturday 6th April, hopefully with an Easter Bunny for photos with the children, as well as face painters. You’ll soon see our temporary exhibition in the vacant Montclare shop next to The Fox. Many thanks to Dominvs, developers of The Fox, for this opportunity. Our next solo project is our Spring Clean Palmers Green on Saturday 11th May. We’re asking our volunteers to assemble at The Triangle at 10am. Clean Up UK is providing equipment such as gloves, graffiti wipes and litter pickers. Enfield in Bloom is also donating some supplies to help us tidy up the green areas. Papa John’s will have some free pizza samples as well. We hope to see you there! The community comes together in a bid to curb David B student muggings urrowe sw After a series of mugging incidents involving local secondary school students being targeted, a new Community Patrol has launched in Enfield Town. Enfield Grammar School’s head Chris Lamb had written to parents each time one of the boys were victim of mugging around the Enfield Town area. Fed up with what seemed to be too regular an occurrence and worried for the safety of the students a meeting was held with parents and other key members of the local community. After much discussion it was felt that having an increased adult presence around the town area might help students feel safer and deter some of these crimes taking place. Love Your Doorstep Founder Emma Rigby held a further meeting with over 50 local people, a mix of parents and community members, head teacher Chris Lamb, the local police team, town centre manager Mark Rudling and Metrobank’s Guy Jones-Owen. The community-led patrol scheme was launched with many keen volunteers signing themselves up on the rota. The first patrol took place on Monday 11th March with instant success. Parents reported that their children felt more confident travelling between sites at lunch and after school. There was even one incident where a group of boys approached the patrol team when a small group of youths were hanging around intimidating them. tunning chain free apartment with views over cricket ground. A spacious three bedroom, two bath/shower room apartment. Located on the first floor of this recently built (2013) modern gated development it is within easy walking distance of Enfield town and mainline station. Benefits include a secure gated entrance, an impressive living/dining space with a modern kitchen and doors to balcony with splendid views, a master bedroom and en-suite shower room, two further bedrooms, a bathroom and an allocated parking space. ewly built with 10 year warranty, three bedroom end of terrace family home. This CHAIN FREE property benefits from an open plan living/dining/kitchen area with wood flooring and bay window and a ground floor cloakroom. The first floor consists of three spacious bedrooms fully carpeted and a modern family bathroom. Further benefits include rear and side gardens with decked patio and off street parking. well-presented spacious two bedroom flat situated on the forth floor popular purpose built development on the corner of Fox Lane and Green Lanes. The property benefits from a spacious lounge/diner, a modern kitchen, a bathroom and separate w.c, two double bedrooms, gas central heating, double glazing, lift service to all floors, entry phone system and communal parking facilities. The property is currently rented on an assured shorthold tenancy and is achieving a rent of £1,100pcm. eautiful chain free Edwardian garden flat. A spacious modern converted flat occupying the entire ground floor of this Edwardian property is located within easy reach of Palmers Greens shops, bus routes and mainline station. The property consists of a spacious living room with large bay window, a modern kitchen/diner with appliances, a contemporary shower room, a double bedroom with doors to own 60ft approx rear garden with decked/lawn areas. 69 year lease remaining. children are able to sit, listen and concentrate. Storytelling is a very important element in our classes. Our storytelling time is always interactive, so children are asked questions – always in Italian – and they are invited to participate actively in it. All our classes at all levels and for all ages are taught exclusively in Italian and students are interacting with our teachers in Italian. As the children grow their attention span grows and they are more able to sit still for longer periods. Students in our Italian 7-9 class, have a chair with a table as they are asked to write in some of the activities. Activities however, are varied and students are expected to move during some of the activities. For example we offer time to work as pairs in small groups on the floor as well as standing time; for example time on the board during a game, a mime activity and so on. The chancellor brought forward the proposed increase in the personal allowance from £11,850 to £12,500 with immediate effect from 6 April 2019 instead of 6 April 2020 as originally proposed. The higher rate threshold was increased to £50,000 and this is also the upper limit for NIC purposes where employees and the self-employed begin to pay NIC at 2% instead of the higher percentages that apply below that level. This means that if your income is below £12,500 a year, you don’t pay any tax. Further you can earn up to £50,000 a year before you fall into the dreaded 40% tax bracket. This will have a positive effect on the amount of money you can earn from April 2019 onwards, which makes it even more important to plan your affairs wisely for the new tax year. The other allowances and reliefs were adjusted either in line with the above change. The transferable marriage allowance which is always 10% of the personal allowance in line with the effect of inflation. No changes were made to the tax rates themselves nor the personal savings allowance, the savings rate of tax or the dividend allowance. For those of you running your own companies, the government have also stuck to their promise of lowering corporation tax to 17% from April 2020. If you require any advice on tax planning or any other tax matters, please feel free to contact us. If you have an accounting question for Alex please e-mail him directly he will be happy to assist you, alternatively Alexander Associates offer an initial free consultation please contact them to find out more. Disclaimer: The information provided in this article should not be construed as legal advice and the information is offered for information purposes only. You should always seek advice from an appropriately qualified accountant on any specific accountancy enquiry. ell presented apartment in great location. A one double bedroom, first floor purpose built apartment located within a few minutes' walk of Palmers Green's shops and mainline station. The property is accessed via a secure video entry phone system and benefits from a living room with balcony, a fitted kitchen, a modern spacious bathroom and a good size double bedroom and an allocated parking space. eautiful modern apartment. A well presented and spacious one bedroom apartment located on the second floor of this former office block which was converted in 2014. The property is located within a few minutes walk of Green Lanes shops and mainline station. Benefits include a secure communal entrance via video entry phone, a lift to all floors, an open plan living/kitchen space and oak wood floor, a spacious bedroom with fitted wardrobe, a modern bathroom and an allocated parking space via secure gates. reat location! A five bedroom Edwardian terrace house located within a few minutes walk of Palmers Green's shops, and mainline station. This CHAIN FREE property which requires MODERNISATION consists on the ground floor of a 25ft through lounge, a 20ft kitchen/diner, a conservatory with w.c and door to garden. The first floor offers three double bedrooms, a single bedroom and a family bathroom. The converted loft offers a further double bedroom. Front garden and a rear garden measuring 88ft approx. well presented four bedroom extended terrace house offering a very generous 1561 sq ft of floor space. The property is located within a few minutes walk of Bush Hill Park mainline station into Liverpool street. The property benefits from a spacious through lounge, a morning room, a modern kitchen/diner with doors to garden, and utility room. The first floor offers three double bedrooms, a single bedroom, a spacious bath/shower room and loft space with potential to convert. Off street parking and a well maintained rear garden of 55ft. Why Choose Palmers Green High School? A PGHS education will give your daughter a great start in life. Headmistress Wendy Kempster discusses the reasons why… ✔ Traditional Values: A forward thinking school with strong traditions. We are driven by our aims, ethos, tradition and values to create a community of parents, pupils and teachers working passionately towards the same goals. Our teaching and pastoral care embed strong moral and spiritual values, exemplified by our 114 year old school motto “By Love Serve One Another”. ✔ Academic Success: We specialise in educating girls, providing exciting learning opportunities to encourage curiosity, creativity and confidence. PGHS is Number 1 of the Sunday Times League Table for small independent schools. Girls leave PGHS with outstanding GCSE results transferring to high achieving sixth forms before moving on to the top universities in the country. ✔ Nursery to GCSE: PGHS is a very special 'through-school' where strong friendships are formed and extend beyond year groups. Pupils progress in a familiar setting, benefiting from seamless transitions across Key Stages and there is an authentic feeling of being one family. ✔ Attention to detail from small class sizes: Small class sizes enable staff to spot and nurture the potential of each individual. Our lower staff to pupil ratios encourage close relationships between staff, pupils and parents and a greater level of individual attention. ✔ Wide range of extra-curricular activities and trips: In addition to academic success, we understand the importance of developing well-rounded individuals. PGHS offers an exciting programme of extra-curricular activities with over 80 running every week! School trips to museums, theatres, galleries, field trips, as well as Language, History and Art trips abroad offer valuable learning opportunities outside the classroom. Other activities include Kingswood, skiing and the Duke of Edinburgh Award. ✔ Teachers: Our School combines high standards of teaching with superb pastoral care. PGHS teachers are highly qualified and passionate about their subject. Specialist teachers deliver timetabled sport, music, drama, art, D&T and languages to pupils at all educational stages. Pastoral care is exceptional and dedicated staff support pupils throughout their time at PGHS. Pupils develop the strength of character and vision to become confident and responsible young people. ✔ Excellent facilities: Learning is enhanced by specialist teaching, facilities and resources. Teaching rooms are all equipped with state of the art teaching walls providing modern, bespoke learning environments. Girls benefit from using the specialist science laboratories, D&T workshop, music suite, library and art studio. ✔ Sports: We are committed to enabling girls to discover and develop their sporting talents. Sports are taught on site and at the local Walker Cricket Ground where the pupils enjoy year round use of the high quality netball and tennis courts, athletics field and football pitch. In addition, we use both Southbury and Southgate Leisure Centres to ensure pupils are offered a diverse range of sporting activities including aerobics, badminton, basketball, swimming and trampolining. ✔ Wrap-around care: In an environment that nurtures and cares for children combined with healthy, nutritious food. We run a Breakfast Club and have exclusive links with M+M Childcare who provide bespoke After School provision for PGHS. ✔ Location: We are your local school. Your daughter can be involved in extra-curricular activities after school and be home at a reasonable time to be involved in activities outside of school, to tackle her homework and still have time to relax. Fabulous hair begins with a healthy scalp by Kiri from Fabulous Hair Company Fabulous Hair Company 382 Green Lanes, N13 5PD Tel: 020 8886 7070 Welcome, firstly I would like to start with an apology. In my last article I wrote about hair trends for 2019 and would continue in this article with colour trends, but with the launch of our new product range of treatments for scalp disorders I couldn’t wait to talk about Mediceuticals products. At Fabulous Hair we have noticed in the last few years an increase in scalp disorders and felt it was time to address this issue with the introduction of Mediceuticals products to the salon. Before we can remedy a scalp problem, we need to identify the condition and to help us, we use a hair analyzer which magnifies the hair by 200x and allows us to choose the best product & a treatment plan for your hair. There are many disorders to discuss and unfortunately not enough space to talk about all the conditions, you can have a look at the full article by visiting our salon website. I’ve chosen two of the most common conditions to write about. Dandruff Dandruff, put simply, is the hyper-production of skin cells often linked to P. Ovale Fungus. Skin cells are produced and shed too quickly which causes flakes of dead skin to fall off the scalp. Millions of people have this chronic disorder. The unmistakable symptoms of dandruff are white, oily-looking flakes of dead skin covering the hair and shoulders, and an itchy, scaly scalp. If you have any questions that need answering quickly, please email me at kc@fabuloushaircompany.com and I will get back to you soon as I can. If you enjoyed my article let us know, like us on Facebook or follow us on Instagram and we will enter you in our monthly competition for a chance of winning a Paul Mitchell in-salon Lavender Mint Mineral Mask treatment worth £25. Just go to our website www.fabuloushaircompany.com, and click the Facebook/ Instagram icon to follow and a chance to win a Fabulous hair treatment. Mobile: 07720 81 01 01 Email: nicolaforward@aol.com Make 2019 the year you tackle your overall health and wellbeing! you need advice or would like an estimate on any works to your property, please feel free to contact me and we can arrange a visit. In the Garden with Paul Knight Creating curb appeal with your front garden Contact Paul on 07957 942728 info@outside-designs.co.uk A front garden can be a thing of beauty. Not just a drab area of concrete with bins on right in on front of your house. It can be an eye-catching place full of plants and shrubs that can add interest all year round. Of course you have to take into account the practical issues of where to put the bins and bike stores etc but this can be accounted for in designing the garden. Even in a small front garden that most of us have there will be space for a few choice plants and possibly even a small tree that will soften the appearance of the property and collectively, the neighbourhood whilst creating a natural environment for birds and insects. within. A simple bin surround constructed with trellis and climbing plants to grow round it to disguise the bins but still gives you easy access to them. The garden path is an important aspect as you use it constantly and you see it all the time The materials for the path can match the materials in the rest of the garden or they can differ, for example have a tiled path with a separate area of paving. As I said before, plants will soften and enhance a house. Whether the garden is in sun or shade there are lots of plants that will thrive. Window boxes will add a splash of colour and can change with the seasons and a climbing rose, Wisteria or many other climbers will look amazing trained on the front of the house. Get outside and get gardening! ewly refurbished two bed flat,occupying the entire first floor of this imposing Victorian building. The flat is offered UNFURNISHED and benefits from a BRIGHT and MODERN living room/kitchen, a master bedroom with an en-suite shower room, a further single bedroom, a bathroom. The property also benefits from communal off street parking. The property is ideally located for Baker Street's local shops and bus routes with both Enfield Town (Liverpool Street in 35 minutes) and Gordon Hill (Moorgate in 35 minutes) stations within easy reach. stunning converted two bedroom duplex apartment occupying the first and second floors of this grade two listed former school building. Renovated to a high standard it benefits from a spacious living area with 14ft high ceiling and original wood block parquet floor, contemporary kitchen, modern bathroom, secure entry phone system and secure gated parking to rear for two cars. Unfurnished, available now. odern gated apartment. A two bedroom, two bath/shower room flat situated on the ground floor. The property is a few minutes walk to Green Lanes shops and Palmers Green's mainline station into Finsbury Park and Moorgate. Benefits include a spacious living room with doors to a communal garden area, modern fitted kitchen, a newly fitted bathroom, a master bedroom with en-suite shower room, a good size single bedroom and an allocated parking space. The property is offered part furnished and is available from the 23rd of April. 5 minute walk to Soughgate tube station. Three bedroom 1930s built end of terrace house located within a few minutes walk of Southgates shops and underground station (Piccadilly line). The property which has recently been decorated benefits from a spacious entrance hallway, a bright through lounge with doors to garden, a brand new kitchen, a family bathroom, two good size double bedrooms, a single bedroom, off street parking and 80ft approx rear garden. The property is available end of March/April and is offered part furnished. eautiful unfurnished family home. A 1920's style extended three bedroom terrace home. The property benefits from a through lounge, extended kitchen/diner, modern first floor family bathroom, two good size double bedrooms with fitted wardrobes, a single bedroom and hard standing to front and 80ft west facing rear garden. The property is within easy reach of Palmers Green's shops and mainline station and falls within Hazelwood School catchment area. Available from the 13th of April 2019.
our bedroom family home. The nearest stations are Wood Green and Bowes Park, which are within ten to fifteen minutes walking distance. The property which has just been painted benefits from a spacious through lounge with doors to garden, a kitchen/diner, two double bedrooms and two good size single bedrooms, first floor modern bathroom, off street parking and large rear garden. The house is offered furnished and is available from the 23rd April 2019. Based on the story of Dido Elizabeth Belle (1761 – 1804), an illegitimate bi-racial girl raised at Kenwood House by her great uncle, Lord Mansfield. SON OF THE BRIDE A funny and moving film about one man’s midlife crisis and his father’s wish to give his wife, suffering from Alzheimer’s disease, the perfect silver wedding anniversary present. Ryota learns that his biological son was switched at birth with the boy he has raised, and he must make a life-impacting decision between his two sons. A woman returns to her Orthodox Jewish community that shunned her for her attraction to a female childhood friend. Once back, passions reignite. BlacKkKlansman uses history to offer bitingly trenchant commentary on current events – and brings out some of Spike Lee's hardest-hitting work in decades along the way. We couldn’t resist taking photos of some of the work Cheryl has done inside her own home, such as this splash back. Our next film will be about that wonderful institution Palmers Green Netball Club. They were founded in 1959 and it is great to see how popular Netball remains to this day. Great to see Netballers of all ages playing in our lovely local park. Local care ca are agency y named Â¿QDOLVWLQ+HDOWK&DUH Â¿QDOLVW LQ+HDOWK& &DUH Investorr Awards Investo Awards This month Hom Home me Care Preferred, a domiciliary ca are provider based in care l, ,received news that for the Hill, Winchmore Hil 5th executive y selecte ed as year they were selected Â¿QDOLVWVLQWKHSUHVWLJLRXV+HDOWK,QYHVWRU Â¿QDOLVWVLQWKHS SUHVWLJLRXV+HDOWK,QYH HVWRU Awards A wards 2019. 7KH+HDOWK,QYHVWRU$ZDUGVSURPRWH 7KH 7K +HDOWK,QYH + OWK, HVWRU W $ZDUGVSURPRWH G W H[FHOOHQFHDQG GUHFRJQLVHRXWVWDQGLQ QJ H[FHOOHQFHDQGUHFRJQLVHRXWVWDQGLQJ performance in n the independent healthcare hea althcare VHFWRUDQGDWWUDFWRYHUJXHVWVHDFK VHFWRUDQGDWWUD DFWRYHUJXHVWVHDFK year to the Grosvenor Gro osvenor House Hotel. As A in SUHYLRXV\HDUVWKHMXGJHVKDYHVHOHFWHG SUHYLRXV\HDUV HFWHG WKHMXGJHVKDYHVHOH RUJDQLVDWLRQVDQGLQGLYLGXDOVWKDWKDYH RUJDQLVDWLRQVD DQGLQGLYLGXDOVWKDWKD DYH PDGHDQRXWVWDQGLQJFRQWULEXWLRQWR PDGHDQRXWVWD DQGLQJFRQWULEXWLRQWR healthcare. involved, and With over 400 companies c a PRUHWKDQJXHVWVRQWKHQLJKWWKH PRUHWKDQ JXHVWVRQWKHQLJKWWKH +HDOWK,QYHVWRU$ZDUGVLVWKHELJJHVWHYHQW +HDOWK,QYHVWRU $ZDUGVLVWKHELJJHVWWHYHQW of the year for tthe health industry. industry. groups of young people who are ineligible for support from the local authority. The definitions of a ‘group’ and ‘young people’ are for the trustees to decide, but, broadly speaking, three and more are regarded as a ‘group and an age up to the early twenties is thought to be ‘young’. In the recent past, there have been grants to groups involved in music-making, drama, bell-ringing and scouting. Groups in Southgate who would like to be considered for a grant, should apply to the trustees by post to 52, Townsend Avenue, Southgate, N14 7HJ. The trustees will wish to know the activity of the group, the number of people involved, the age-level, the purpose for which funds are required and what money is already available. Ian Cameron Black. Homes to receive free furniture and the two-tier pricing strategy allows those that are in receipt of benefits to be given a discount on already low-cost furniture. They rely solely on donations and as a result have diverted more the 871 tonnes of unwanted furniture that would otherwise have been sent to landfill. "A huge thank you goes out to our hardworking pool of volunteers as the work we do would not be possible without their help. Our volunteers provide us with an amazing range of skill sets, from carpentry, painting, upholstering & upcycling furniture to answering phones, administration and helping in the warehouse. We pride ourselves in offering training in the above skill-sets to the long-term unemployed and for those who have had difficulties in life. We are always looking for new people to lend us a hand, so if you have some spare time and want to give a little back to your community then please do get in touch!" They offer a free collection service in the Borough of Barnet and the surrounding areas. They collect all reusable household furniture, household electricals, white goods, homeware, brica-brac, glassware and crockery. All items must be in a good, clean condition; hard furniture must be structurally sound, soft furnishings must be free from rips, tears and stains and are required to have a fire-regulations label attached; household electricals and white goods must be working, clean, disconnected and no older than 5 years in order to be accepted. Fariz Uvais is a Consultant Solicitor at Fahri LLP based in Whetstone North London. Write in and ask your legal questions. 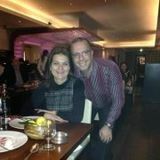 Fariz will try and answer your questions in Palmers Green LIFE each month. Send your questions to Fahri LLP, 1268a High Road Whetstone, London N20 9HH or by email to fariz@fahrillp.com. Tel: 0203 813 8457 A Lasting Power of Attorney (LPA) is a legal document which enables you to plan ahead and set out in advance what you would like to happen should you become incapable of managing your affairs in the future. In the LPA, you appoint one or more ‘attorneys’ who will be able to make decisions on your behalf. An attorney is anyone you choose and trust. He or she must consider your best interests when making a decision on your behalf. There are two types of LPA: A property and financial affairs LPA This gives your attorney the authority to deal with your property and finances, as you specify. A health and welfare LPA This allows your attorney to make health and care decisions on your behalf, only when you lack mental capacity to do so yourself. This could also extend, if you wish, to giving or refusing consent to the continuation of life sustaining treatment. unduly pressured into making the LPA. It must then be registered with the Office of Public Guardian before it can be used. The property and financial affairs LPA can be used both when you have capacity to act, as well as if you lack mental capacity to make a financial decision. The health and welfare LPA can only be used if you lack mental capacity to make welfare or medical decisions for yourself. What happens if you have not made a LPA? If you lose capacity and have not made an LPA then it may become necessary for a relative or friend to apply to the Court of Protection, to make decisions on your behalf. Although the Court endeavours to appoint somebody who would act in your best interests, you could potentially have somebody managing your affairs that you would not have chosen had you had capacity. An application to the Court is very time consuming and costly. To avoid this, it is sensible to put in place an LPA when you can. Maths Tuition at your home. £30/hr. Fully Qualified Tutor, B.Sc. PGCE. DBS cleared. Free Trial Lesson with no obligation. Proposed Draft Domestic Abuse Bill On 21st January 2019 the Government published the long-awaited draft Domestic Abuse Bill that aims to help raise awareness, protect and support victims suffering from domestic abuse and transform the justice process by prioritising the victimâ&#x20AC;&#x2122;s safety in criminal and family courts. children that are exposed to the abuse as a result of living in the same household. This alone can be detrimental to their future relationships and therefore it is imperative that children have an understanding of what a healthy relationship should be. For the first time, a broad statutory government definition of domestic abuse will be incorporated into legislation that identifies the complexity of the abuse as it acknowledges the various forms of abuse on a psychological, emotional, economical and physical level. It is hoped that victims will be better equipped to recognise the signs of abuse early on and take steps to seek help. 2. Introducing Domestic Abuse Protection Notice and Domestic Abuse Protection Orders to give victims the protection and time to seek help. Partyâ&#x20AC;&#x2122;s subject to ongoing family proceedings, criminal proceedings and some civil proceedings can apply for these Orders. The draft Bill proposes that under a Domestic Abuse Protection Order, the Court will be able to Order electronic monitoring so that the perpetrators are monitored in terms of not only their geographic location but also if they are complying with other Court requirements such as attending an alcohol rehabilitation programme. Breach of such orders will be regarded as a criminal offence with a maximum penalty of five years imprisonment and/or unlimited fine. The Court also has discretion to punish a breach as a contempt of Court which is an alternative option to criminal proceedings. Why instruct Chapman Pieri Solicitors? What is “Coercive Control” that has been all over social media? A woman who was sentenced to 22 years in prison in 2011 for killing her husband has won her appeal against her murder conviction which will now be retried. Her sons fought tirelessly for this. Sally Challen killed her husband Richard in 2010 during an attack in which she hit him more than 20 times with a hammer. Sally has maintained that she had been subjected to years of psychological abuse and controlling behaviour from Richard and during the original murder trial, she claimed diminished responsibility on the basis of this. An offence is committed by A if: • A repeatedly or continuously engages in behaviour towards another person, B, that is controlling or coercive; and • At time of the behaviour, A and B are personally connected; and • The behaviour has a serious effect on B; and • A knows or ought to know that the behaviour will have a serious effect on B. That conviction has however now been quashed by three judges sitting at the Court of Appeal. This decision was made following the presentation of new evidence by a psychiatrist which was not available during the original trial. One of the judges, Lady Justice Hallett said “….in the opinion of a consultant forensic psychiatrist, the appellant was suffering from two mental disorders at the time of the killing”. As a result of this, the judges held that the murder conviction was unsafe and a retrial will now take place. Examples of behavior which a perpetrator may engage in can include but is not limited to; isolating the person from their friends and family, repeatedly putting them down such as telling them they are worthless, enforcing rules and activity which humiliates, degrades or dehumanises the victim, and financial abuse including control of finances, such as only allowing a person a punitive allowance. Chapman and Pieri Solicitors are here when all avenues have been exhausted and you need professional support to help you navigate what may be a very emotionally challenging time ahead. We have a team of experienced family lawyers chosen for their warm approach to help you through your journey. If you want to speak to a solicitor please call on 020 8882 9850. We offer a no obligation initial consultation for £75 plus vat.